Come join us at our next chapter meeting 1/30/2019 7-8p.m. @ the Price Science library room B042. 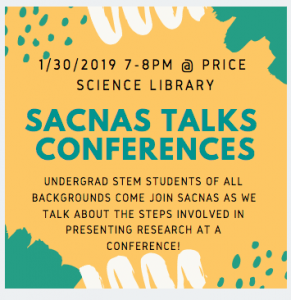 SACNAS will discuss conference opportunities for undergraduates to present their research, and how to write and submit abstracts along with other helpful tips and tricks about attending a STEM conference! Feel free to bring friends, we invite students of all backgrounds to join!